Family friendly entertainment can be hard to find. There are many films out now that cover Biblical events, yet they are written and produced by non-Christian people, even self-declared atheists. How can you even know if they are creating a fictional story just to get ratings? 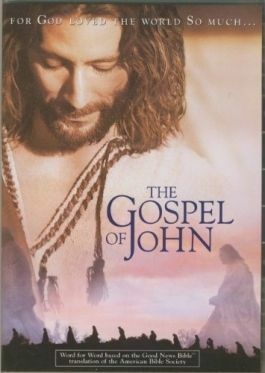 I was excited to get the opportunity to review The Gospel of John ($6.95) from FishFlix.com. We had a chance to watch The Gospel of John (Rated PG-13). This title brings to life the last few weeks of Jesus life in a family friendly manner. It allows children to see the pain of what Jesus endured without all the drama and R-rated material added to provide extra drama and draw people to watch. The Gospel of John is rated PG-13 since this time of Jesus' life contained some very hard times and the torture methods used by the people were hard to see. There was a cast of over 2500 people that brought this time period to life. Christopher Plummer serves as narrator and it stars Henry Ian Cusick as Jesus. The Gospel of John definitely was written based on the Bible and not opinion or written to just draw people to see it. Sometimes I find Biblical re-creations "hokey" or just not well-written. Since Biblical discrepancies can creep into many movies, I was very happy to not see any with this film. This is definitely a title for Christian families to have on the shelves. I thought it was ok to be viewed by kids 10 and up, but that would be up to your family. I definitely found The Gospel of John much more family friendly than other options out. FishFlix.com offers sales on many titles, and even has free shipping on orders over $40.00. Their website is easy to navigate and has titles easily categorized for quick searches.